VDBs can contain one or more models representing the information to be integrated and exposed to consuming applications. Models must be in a valid state in order for the VDB to be used for data access. Validation of a single model means that it must be in a self-consistent and complete state, meaning that there are no “missing pieces” and no references to non-existent entities. Validation of multiple models checks that all inter-model dependencies are present and resolvable. A VDB must always be in a complete state, meaning that all information is contained within the VDB itself – there are no external dependencies. 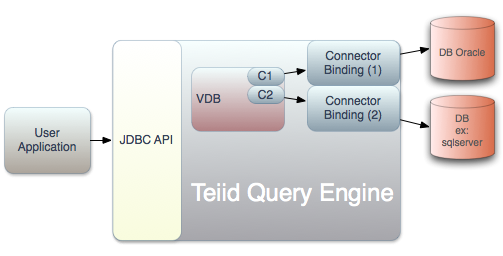 You can define configuration for Translators and Resource Adaptors in Teiid Designer. Once defined, Translator information along with the JNDI name of the Resource Adaptor is stored with a VDB, so that when a VDB is exchanged, the existing settings can be used. Typically Resource Adaptor configuration information contains user-ids, passwords, URLs to the physical data sources. This information is not stored with the VDB. These are automatically created by Designer for development purposes, however user need to migrate or create new ones for the production environment themselfs using the provided tools like Admin Console.